"Winning BCS Trophies is Part of Southern Heritage"
ATLANTA, GA - (@The Comedy News) - The Board of Directors of the Bowl Championship Series (BCS) organization, the entity responsible with crowning the National Champion of college football every year, has decided to add the Confederate Flag to the BCS trophy. "After reviewing the past fourteen match-ups for the BCS National Championship, we have come to conclude that winning the National Championship in football is primarily a southern tradition," explained a BCS spokesman. 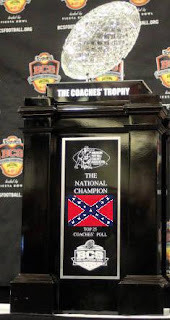 The trophy belongs in the south, and what better way to commemorate the south's connection with college football triumph than to put the Confederate Flag right on that trophy." Many critics see the move to add the historic emblem to the BCS trophy as more evidence that the BCS panders to the southern and bible-belt regions of the country. "The re-match of #1 LSU Tigers and the #2 Alabama Crimson tide in the 2012 National Championship game is clear evidence that the south gets special treatment when it comes to football rankings," explained the chairman of the Cousins and Uncles of Union Pacifists Foundation. "Honestly, f#!k it, I don't even care anymore. It's not about football anyways, it's all about selling corporate slogans." The facts show, however, that non-ex-Confederate states do not fare well in getting to the National Championship game. The only Union states that have appeared in the big game are Oregon, Ohio State, and USC. Still, the BCS stands by its move to put the Dixie flag on the National Championship trophy. "If it were the other way around, if the Union states were winning championships left and right, we would consider putting a chai tea latte, a high school diploma, or Bruce Springsteen face on the trophy," explained the BCS spokesman. "Until then, the BCS shall recognize that the South has risen again."